Made by hand, in small batches, by artisans who have dedicated years to mastering their craft—that’s Scarpe di Bianco. 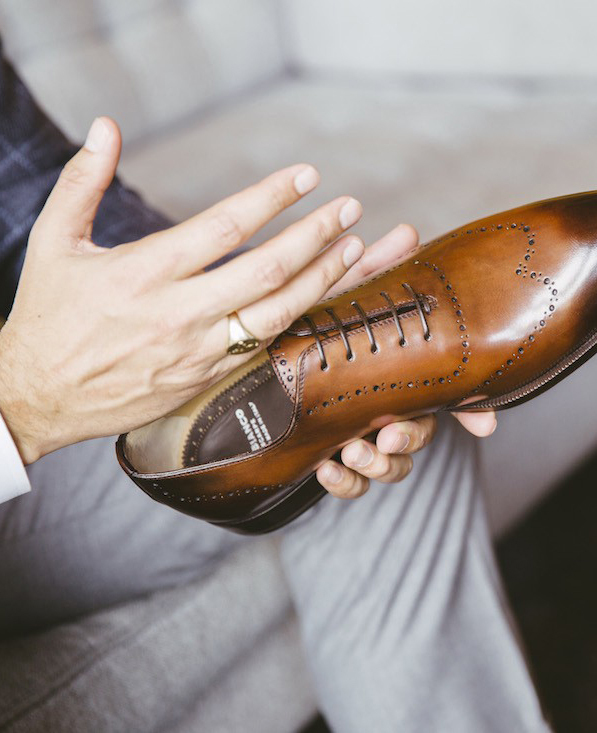 We spoke with Bill White, the founder of this luxury shoe company, to learn what goes into making a single pair. Along with the brand’s intricate process, he shares his approach to good design, the importance of owning well-made shoes, and why the rooster on his ring is facing the wrong direction. 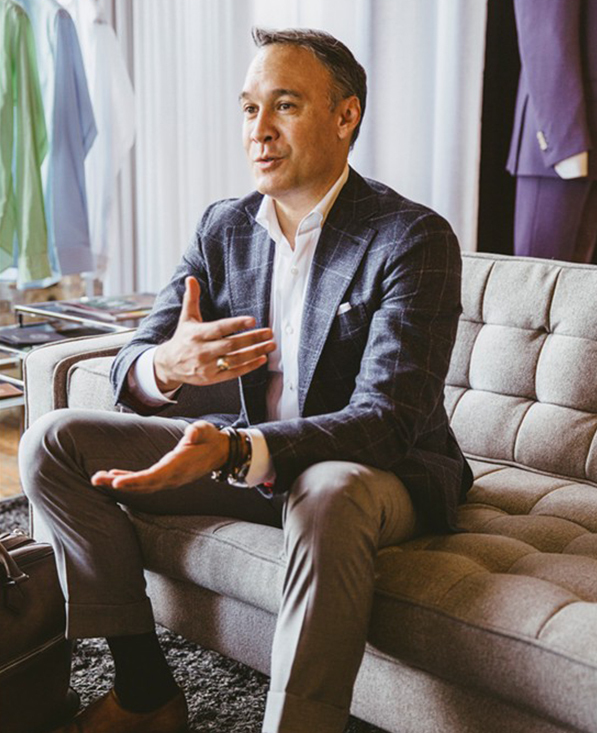 Scarpe di Bianco creates some of the most popular shoes in Trunk Club’s inventory. Can you tell us more about your approach to shoemaking? I never want to replicate what somebody else is doing. 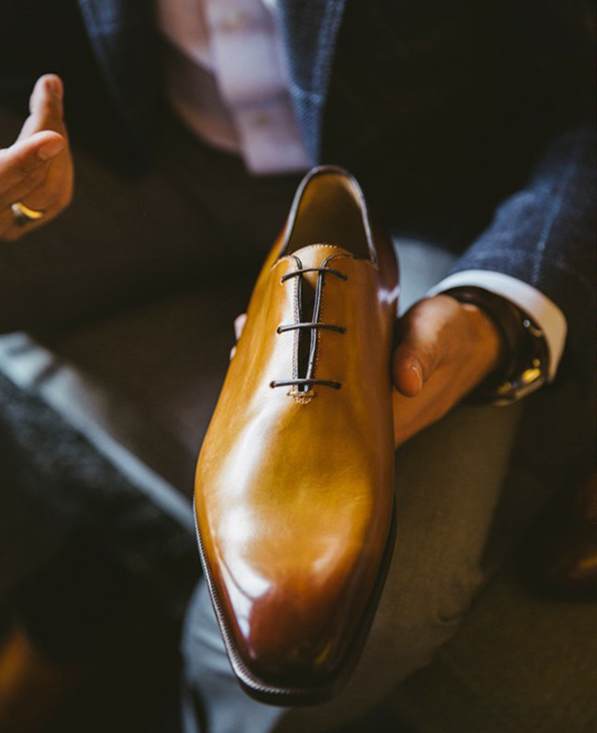 For example, I’ll make a classic cap-toe shoe, but use a Scotch grain leather with a modern color and give it some burnishing — that creates a more modern look. If you don’t have that twist, it’s just a classic shoe. However, if you have two modern twists, then the shoe becomes fast-fashion and it’s no longer a good investment. There’s a delicate balance. How did you start making shoes? Earlier in my career I worked for a management consulting firm that focused on apparel and consumer goods. One of the projects I worked on was the repositioning of a 100-year-old shoe company based in Italy. I really enjoyed it, and loved working with a tangible product. That’s where I learned the shoemaking process. You mentioned that shoes are an investment. That’s also something we believe in at Trunk Club. If you want beautiful shoes that will last a long time, you have to invest. A well-made pair of shoes will last you seven to ten years, maybe longer. Really, there are two things you should invest in: a good bed and a good pair of shoes. That’s because if you’re not in one, you’re in the other — and on a really good night, you might be in both at the same time. All of your shoes are handmade in Italy. Did your love for Italian products come from working with that 100-year-old company? I’ve always been interested in investment pieces, and items that have a story. Our heritage comes from craftsmen who have been making shoes for most of their lives. 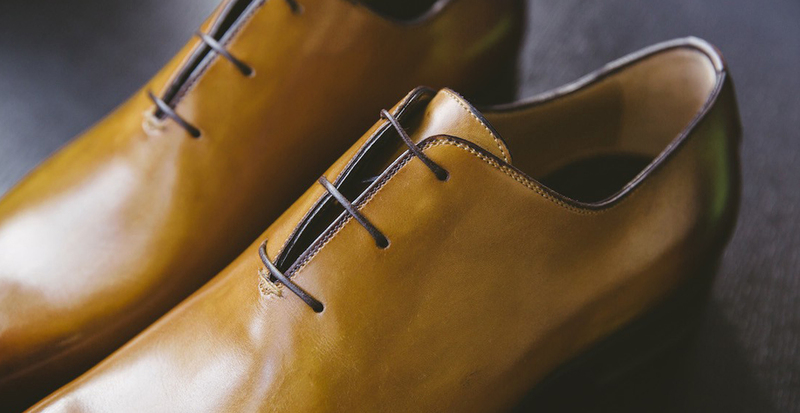 It takes years and years of apprenticeship to be able to create beautiful shoes like ours. In one of our factories, there’s only one guy who does the most complicated burnishing. 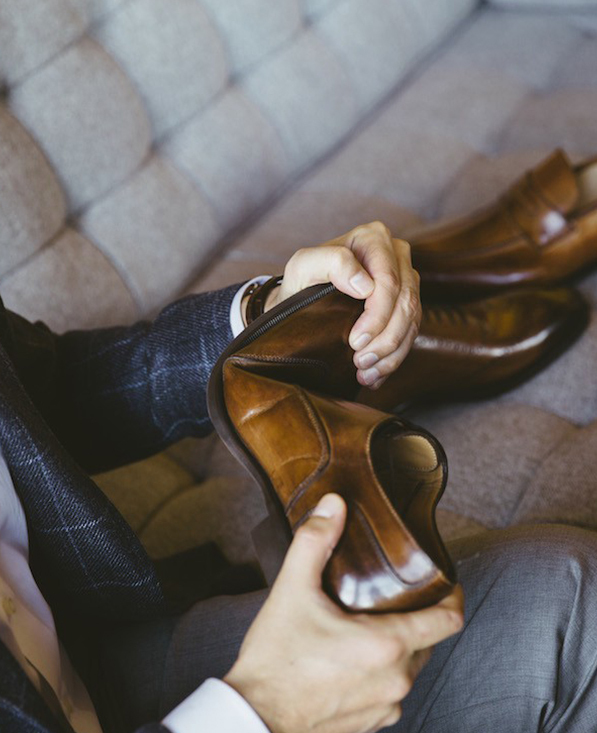 Since craftsmanship is such an important part of your brand, can you tell us more about your shoes’ construction process? We start with one full piece of leather, which comes in the shape a cowhide. We cut around all of the imperfections to ensure that the leather we use is flawless. Then we tan and burnish the leather with natural oils, and sometimes even champagne. We then put the shoes on a last, which is how we mold the shoe, for a minimum of two weeks. A lot of shoe brands last their shoes very quickly — sometimes only for a few hours. Those shoes tend to lose their shape very quickly. After that, we apply the sole by hand. Actually, every step is done by hand. It makes for a long process, but I think it’s a really good one. We only make 14 pairs of shoes per day. Yes. One factory only has five people who are able to do the level of work that’s required. One person is cutting the leather, another person is lasting the shoe, another person is creating the soles, another person is burnishing the leather, and another person is driving the truck. Frankly, we’re not set up to offer these shoes to a lot of people. They’re very special. You have three different brands: Scarpe di Bianco, Gallo Bianco, and SPQR. Can you tell us about each one? Scarpe di Bianco shoes are 100 percent handmade. Even the sole is handmade, which is very rare these days. About 95 percent of shoe companies use pre-made soles. With Gallo Bianco, everything on the shoe is done by hand, but we use a pre-made sole, which makes for a slightly less expensive process. This way, we can offer our shoes at a more approachable price. And SPQR is your sport line? Yes, and every shoe in our SPQR line has a rubber sole. There’s a stigma about rubber soles, but they’re really a practical convenience for a lot of people, so I wanted to create a great rubber-soled shoe that has the look of a shoe with a leather sole. I also use a very high-density rubber so it doesn’t wear down quickly. The construction technique that we use for SPQR is called “Bologna,” which eliminates the midsole. You can literally bend the shoe in half and it will bounce right back to its original shape. We also use a techno-gel imported from Germany in the insole for added comfort. There’s absolutely no break-in period. 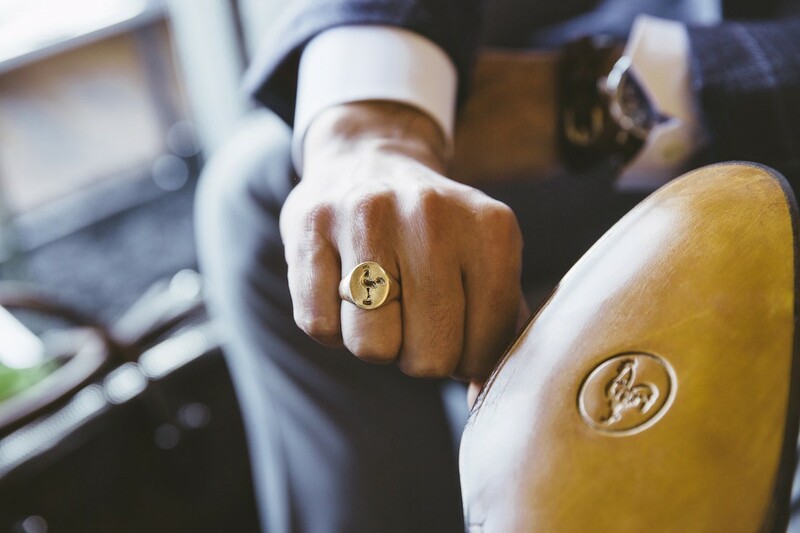 The ring you’re wearing has a rooster on it, which is also the logo that you use for your Gallo Bianco line. Can you tell us the story behind that? There’s a rooster on my family’s crest, and my father gave me this ring when I was 18. He and my brother have one as well, but the rooster on their rings is pointing right, to the east, which is because the sun rises in the east and the rooster is the first farm animal to wake up. They crow to let everyone know that the day has started. My dad was an agronomist and my brother works in insurance — both serious professions. I went into fashion pretty early, and I was always the black sheep of the family. My father had my ring made with the rooster facing left, to the west, to let me know, “Hey, you’re heading in the wrong direction.” Anyway, after more than 25 years in this business, I think he’s come around and likes what I do. He wears my shoes, so I think that’s an endorsement right there. Because of their meticulous craftsmanship, only 14 pairs of Scarpe di Biancos are made each day. To try on a pair for yourself, just ask your stylist.